The troll army has captured and imprisoned Dunstan's son Godric in the Troll Stronghold. Can you rescue Godric from the trolls in this quest? The Imperial Guard raid was a failure, and Dunstan's son has been captured by the trolls! Journey through Trollheim to the Troll Stronghold, and rescue him! Talk to Denulth in Burthorpe. First off, speak to Denulth in the village of Burthorpe and ask him how the battle with the Trolls has gone. The fight hasn't gone so well, and Dunstan's son Godric has been captured by the Troll army. Ask if you can help, and then tell him that you'll get Godric back, since you were the one who got him into the Imperial Guard in the first place. Before you head off to the Stronghold, you're going to need a pair of Climbing Boots. If you don't already have a pair, follow the road just north of Denulth's house to the west, and then head southwest to Freda's house when the road ends. Ask if you can buy some Climbing Boots, and he will sell you a pair for 12gp. You may also want to bring some food, as well as some Restore Prayer Potions if you have a high enough Prayer to use Protect From Melee. Once you have your supplies, go through the underground route to Death Plateau that you located in the Death Plateau quest. With your climbing boots on, climb over the rocks to the northwest of the cave's entrance. Proceed east, climbing over some more rocks until you reach the wooden gate. Open it and talk to Dad (level 110), who challenges you to fight. Accept the duel. Dad may knock you back, inflicting meager damage, but the fight should not be too difficult. He only has 5500 hitpoints. After the fight, go through the northeast gate, but be careful of the level 108 and 106 Mountain Trolls in the area. Enter through the cave at the end of the path, run past the Trolls and exit the cave at the other end. Now walk along the path until you find some rocks on the side blocking the path. Instead of climbing them, use your Protect From Range prayer and run past the Thrower Trolls.Continue along the path, walk up the ramp next to the Mountain Trolls, and enter the Stronghold. Once inside, head south to the door, open it and attack the Troll General (level 171) to the north. Despite its high level, it is a relatively easy fight. Once you kill him, pick up the Prison Key that he drops and head south, out the door and down the stairs. Now go north to unlock the Prison Door, and then head downstairs to the jail. Go southwest to find several jail cells, as well as two level 71 sleeping guards: Twig and Berry. 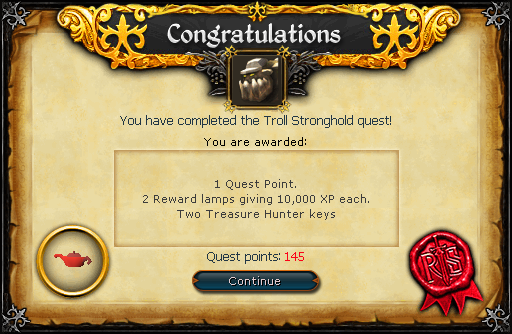 If you have 30 Thieving, you can pickpocket them - otherwise, you'll need to kill them for this last part of the quest. Pickpocket or kill Twig for Cell Key 1 to unlock Godric's cell, and then pickpocket or kill Berry for Cell Key 2 to open Eadgar's cell. Now head back to Dunstan to finish the quest! Two mysterious lamps that give 10,000 experience to any two skills of your choice level 30 or higher.